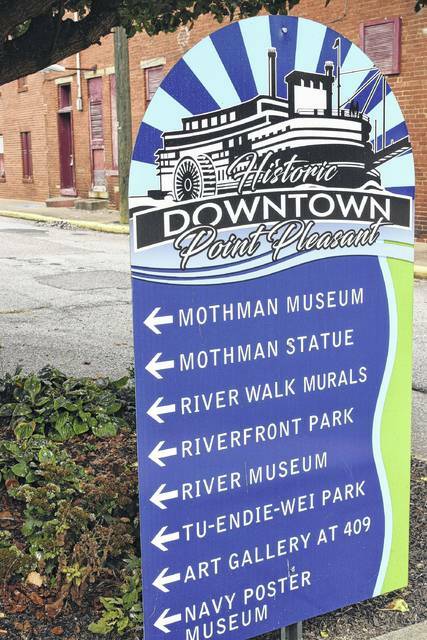 POINT PLEASANT, W.Va. — More than the Mothman makes Point Pleasant, W.Va. unique. Take, for example, its Main Street Museum Trail that consists of not one, not two, but three museums all contained between First and Fifth Streets, downtown. Within walking distance of one another, these museums are as entertaining as they are informative. Starting on the corner of First and Main streets, and near the entrance to Tu-Endie-Wei State Park is the Point Pleasant River Museum and Learning Center, otherwise known as the “River Boat Museum.” The museum focuses its exhibits on river life, information on the historic Silver Bridge, offers a riverboat pilothouse simulator, and explores commercial enterprise on the Ohio and Kanawha Rivers. Walking in the front doors to this museum there are many newspaper articles, river artifacts and video presentations in view. Along the edge of the walls and among other rooms to the first floor are also antique diving outfits, a 2400-gallon fish aquarium featuring various native fish from the Ohio River, and unique merchandise for sale. The staircase to the second floor of the museum leads visitors to the riverboat simulator (complete with a replicated pilothouse and computer-generated scenarios), a research library, and other attractions. Museum hours are Monday through Friday, 10 a.m. until 3 p.m., Saturday 11 a.m. until 4 p.m., and Sunday 1 p.m. until 5 p.m. Located on the corner of Fourth and Main streets, just within eye shot of the much visited Mothman Statue, is The World’s Only Mothman Museum – a recent “staple” in the community run by Jeff and Julie Wamsley. 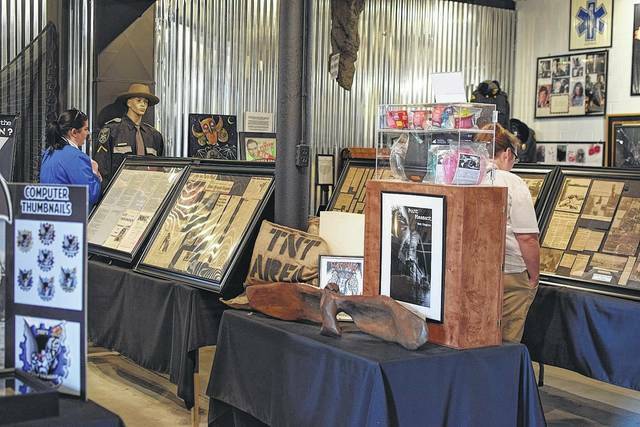 The Mothman Museum has been open for 11 years and at its new location for three years. This museum includes historic information about the Mothman and the events that followed his alleged appearance in Point Pleasant. In addition, there’s a new section featuring a fountain display from the now closed Harris Steakhouse and its owner, the late Carolin Harris, an interactive kiosk, and a variety of merchandise for sale. Along with the museum, the Wamsleys initiated the Mothman Festival in conjunction with their the museum. The Mothman Museum has something to offer to anyone interested in history, conspiracies, small towns, mysteries, and cryptology. The museum’s hours (through Labor Day) are Monday through Thursday, 11 a.m. – 5 p.m.; Friday, 11 a.m. – 6 p.m.; Sunday, noon to 5 p.m. The World’s Only U.S. Navy Poster Museum, located in the 400-block of Main Street (in the former home of the Mothman Museum), displays several examples of vintage Navy posters and memorabilia. Owned by U.S. Navy veteran Kelly Fields of Point Pleasant, the museum has a wide variety of posters for visitors to take in, ranging from the Spanish-American War in 1898, all the way to recent conflicts and their related posters. The museum has three sections featuring three major artists from World War II: Matt Murphey, McClelland Barclay and John Faulkner. Fields had been collecting the memorabilia since 2002 and opened the museum three years ago. The museum also features work by James Burbank, who produced art during the 1930’s for the Navy. Some sections feature a particular artist’s work, a given theme such as submarines, Navy pin up girls, “WAVES” posters encouraging women to join the Women for Volunteer Emergency Service, and “Loose Lips Sink Ships” posters encouraging the public to not talk about Navy ship locations. The museum is open Saturday and Sunday from noon to 5 p.m. and posts updates to its Facebook page. Find it on Facebook by searching U.S. Navy Poster Museum. Visitors to The World’s Only Mothman Museum in Point Pleasant this week. https://www.mydailytribune.com/wp-content/uploads/sites/42/2017/09/web1_9.2-MothmanMus.jpgVisitors to The World’s Only Mothman Museum in Point Pleasant this week. 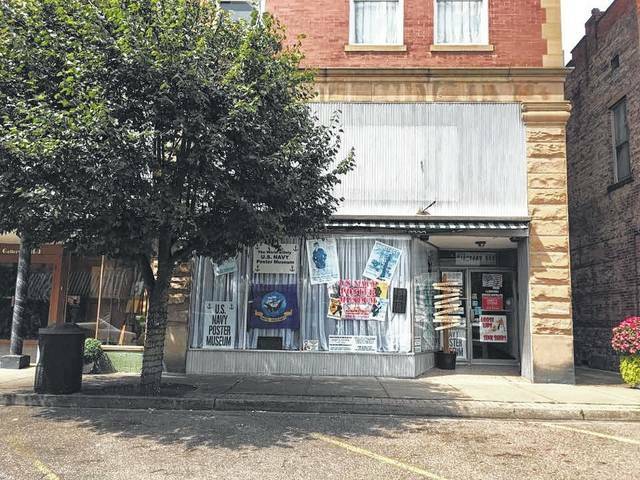 The World’s Only U.S. Navy Poster Museum in the 400-block of Main Street, contained within the Lowe Hotel complex and next to Gallery at 409.
https://www.mydailytribune.com/wp-content/uploads/sites/42/2017/09/web1_9.2-NavyPosterMusuem.jpgThe World’s Only U.S. Navy Poster Museum in the 400-block of Main Street, contained within the Lowe Hotel complex and next to Gallery at 409. 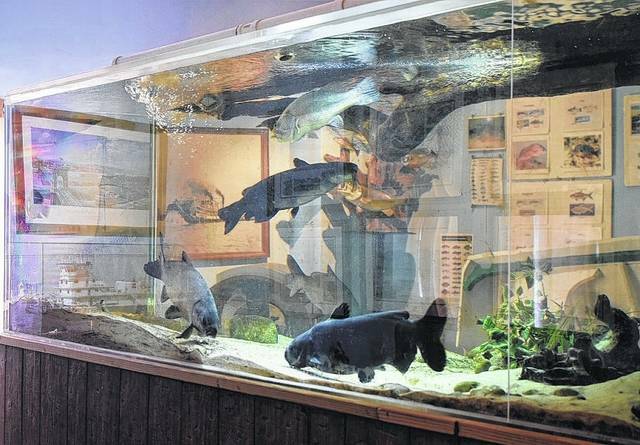 A 2400-gallon fish aquarium featuring various native fish from the Ohio River is one of several unique displays at the Point Pleasant River Museum and Learning Center. The museum is also known for its archive of materials on the Silver Bridge Disaster. https://www.mydailytribune.com/wp-content/uploads/sites/42/2017/09/web1_9.2-PPR-Fish-Tank.jpgA 2400-gallon fish aquarium featuring various native fish from the Ohio River is one of several unique displays at the Point Pleasant River Museum and Learning Center. The museum is also known for its archive of materials on the Silver Bridge Disaster. From left, sisters Ruth and Martha Fout help keep the Point Pleasant River Museum and Learning Center moving full steam ahead. 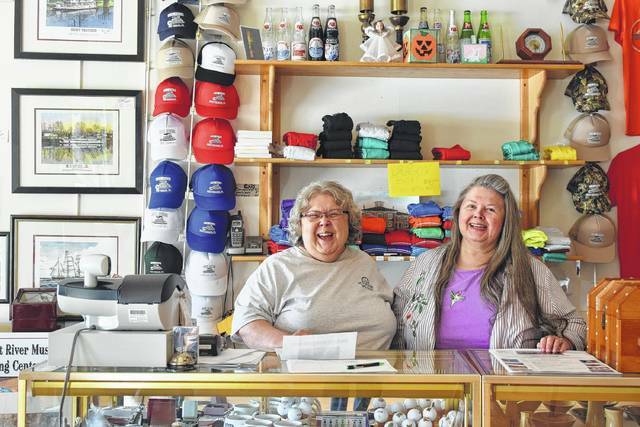 https://www.mydailytribune.com/wp-content/uploads/sites/42/2017/09/web1_9.2-Ruth-and-Marth-Fout_BoatMus.jpgFrom left, sisters Ruth and Martha Fout help keep the Point Pleasant River Museum and Learning Center moving full steam ahead. These signs are popping up in downtown Point Pleasant, directing visitors to area tourist destinations, including downtown’s three museums. https://www.mydailytribune.com/wp-content/uploads/sites/42/2017/09/web1_9.2-Sign.jpgThese signs are popping up in downtown Point Pleasant, directing visitors to area tourist destinations, including downtown’s three museums. Miranda Wood is a freelance writer and photographer for Ohio Valley Publishing.